Alexander Stubb, the Minister for Foreign Affairs, appointed a delegation to develop Finland’s country brand in September 2008, and Jorma Ollila, Chairman of the Board of Directors of Nokia and Shell, was invited to be its Chairman. 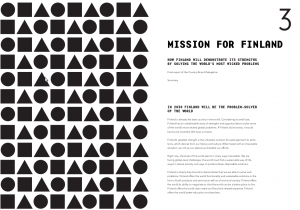 The work culminated in a country brand report published at the end of 2010 called ”Mission for Finland – How Finland will demonstrate its strenghts by solving the world’s most wicked problems”. It is very well made and we recommend reading it to everybody in the world! Seravo Oy as a company is built specifically around functionality, on getting things done, delivering measurable and proven results. As typical Finns we rather solve problems than talk about them. The slogan from the country brand report ”Consider It Solved” suits us well. The report mentions Linux and open source software numerous times (pages 45, 57, 89, 91, 99, 111, 113 and 149). In proportion to the 5 million population Finns have amazing achievements in the open source world like Linux, MySQL, SSH and IRC among others. The Finnish Wikipedia was the 14th to reach 200 000 articles even though by population Finland is the 115th in the world. The report claims that openness and collaboration is a Finnish national trait. It also helps that Finland is viewed as a neutral country in international settings. I doubt any American or Russian could have fostered world wide collaboration better than Linus Torvalds. The former Finnish president Martti Ahtisaari got a Nobel price in 2008 for his work as an international conflict resolver and certainly he too benefited from his nationality and national traits as a humble, problem oriented down to earth person. The brand report also promotes openness in governance and education, including open data and open access. It repeatedly brings forth from several point of views that the challenges we face in modern times can effectively be solved only with openness and networks, not with restrictions and hierarchies. In computing this is already reality, and the rest of society will follow. In the foreword of the report they mention the classic scene from movies, where an emergency happens on an airplane and the personnel announces the request ”Is there a doctor on board?”. The country brand delegation wishes that whenever there is a problem anywhere in the world that needs solving, people would ask ”Is there a Finn on board?”. Indeed, following this example, Seravo’s slogan could very well be: So you are running Linux? Do you have a Finn on board? Update 6.1.2013: It looks like the site maaraportti.fi does not work anymore. The report (version in Finnish) is still available via Google Cache.